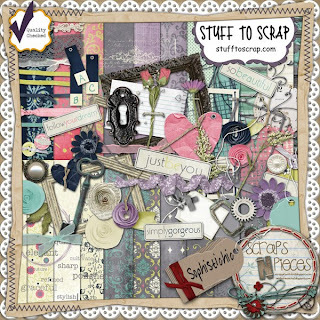 Did you know there's a Project 52 challenge going on at Scraps N' Pieces? The first week is complete, but you can join in at anytime. Each week you complete on time, you get 5 challenge points (5 more if you use at least 90% Scraps N' Pieces store products). The first week's challenge was to pick one person to do the project on for the year, and create a cover page. I decided to pick me since I hardly EVER scrapbook about myself. Tried in the past, so hopefully I will be able to finish this one. 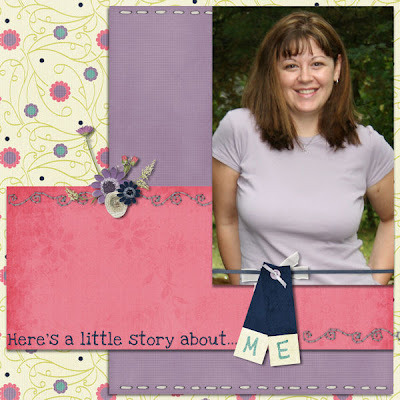 I used the awesome kit Sophistichic by Scraps N' Pieces. Lori & Heidi create amazing stuff, don't they? Image is linked to the store. Yes, I realize this picture is...oh, say...almost 7 years old, but I was at least 70 pounds lighter here and it's one of my better pics.